Today I'm very excited to be taking part in the blog tour for a thriller that is full of promise. 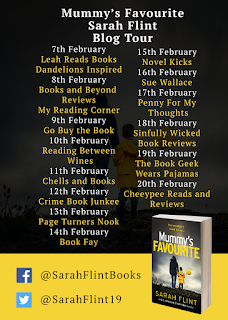 Mummy's Favourite by Sarah Flint might still be on my TBR pile right now, but I guarantee you it is one of the first books I'll be picking up when I get chance to. 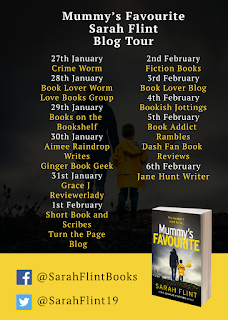 I've got an exciting extract from the novel for you to enjoy right now which, hopefully, will spark your interest enough to go out and grab a copy of the book to read yourself. All information on where you can buy the book below. And once I've read the book, I'll be sharing a review. So keep an eye out on that. But for now, enjoy the extract! 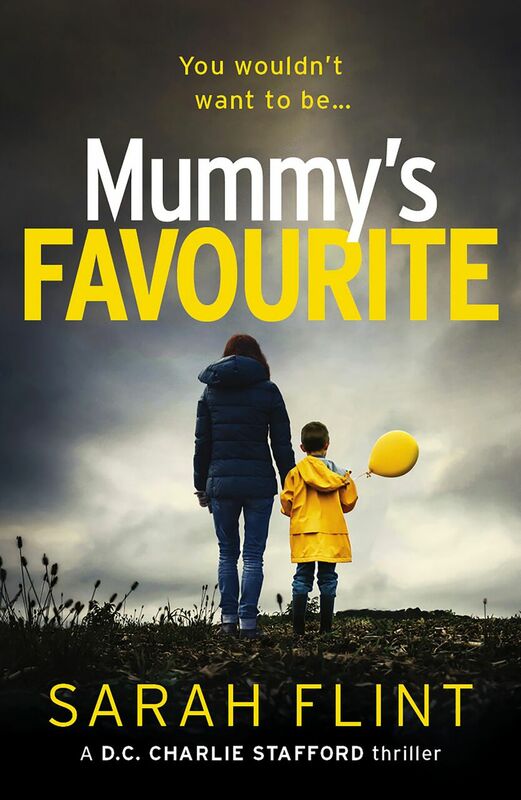 "There were three DV reports in total; not as many as other cases she’d dealt with so far, but then, how many more incidents had happened before getting to the point where police were called? The facts made horrific reading. Bet had given her the statistics when she’d joined their office and she had them stored in her head for easy consumption. Statistically, domestic violence issues affected one in every four women and one in every six men and led on average to two women being murdered every week and thirty men each year. DV allegations accounted for sixteen per cent of all violent reported crime, but were also the crimes most likely to go unreported and the most common crime leading to suicide. A lot of the time the information she stored was useless, but these facts weren’t irrelevant, they were shocking, and perhaps the most shocking of all, that Charlie could not get out of her head, was that on average there were likely to have been thirty-five assaults before a victim called police. Thirty-five! She couldn’t believe it when she first heard that particular statistic and it made her job in the unit that much more significant. She could really make a difference to the dozens of women and men living in fear of day-to-day abuse. If only they would let her. She wondered how many assaults Julie had endured before she’d first picked up the phone. According to the reports, the family lived in a quiet residential area, the sort of street where nobody would guess what went on behind closed curtains and would never dream of asking. She read the first report. Police had been called to a heated argument between Julie and Keith. It had escalated to the stage where Julie had been pushed around, held against the wall and forced down on to the bed. Nothing sexual had happened, but Richard and Ryan had witnessed the fight. Indeed, it had been Richard who had made the call to police and recounted what he’d seen. It was doubtful Julie would have reported the incident had her son not called it in. Charlie flicked down to the outcome. Nothing much had been done on that occasion. There were no injuries and the two adults had denied anything more than a verbal exchange had occurred. All was calm and they had promised it would remain so. Neither wanted any further action to be taken, but the incident had been recorded and the fact that the boys had witnessed it had brought it to the attention of social services. The second incident had again been reported by Richard. The details were much the same, except this time the level of violence had escalated somewhat. There was still no hospitalization, but a couple of healthy bruises to Julie’s cheek and upper arm bore witness to where she had allegedly been grabbed and pushed back against the bedroom wall. A number of items perched on the top of a chest of drawers had been swept across the room, making the scene appear chaotic, with face creams spilling out over the carpet and pot pourri scattered and trodden into the cream. Keith had found himself in the back of a cramped, smelly police van, but the resulting half-day in a cell failed to dull his desire to resort to force and, even though his timid wife had refused to press charges, it had not opened his eyes to the fact that she was now living in fear. Worse was to follow, and on the third and final occasion, Julie had ended up in the Accident and Emergency department of their local hospital, having her arm put in plaster where it had been twisted and forced backwards, snapping one of the bones at her wrist. She alluded to having had a fall but refused to make a statement, no doubt fearful of the resulting violence that Keith seemed keen to dole out. Richard had, however, told police what he had seen and this time Keith’s stay at the police station lengthened into a trip to the local court-room on a charge of GBH. True to form, Julie refused to testify and the Crown Prosecution Service decided against putting their juvenile son in the witness box to give evidence against his father. The case was dropped and Keith walked free. He attended an anger management course and, on follow-up calls had apparently sworn to the CSU officer that things had been going well." He's watching... He's waiting... Who's next? I hope you enjoyed the extract. Let me know in the comments if you have read, or plan to read, this book! The field of the land is so huge and you ought to gain proficiency with about the things which are identified with this field. It is essential to gather the information and advancedwriters reviews information is the foundation of each coordinator. It is an instructive article.